It's always comforting to see a friendly face from your past when you've transplanted to a new city. When I caught up with an old acquaintance, we realised that we've known each other for 10 years. 10 years. Now spanning over three cities, it amazing how big and how small the world seems at the same time. 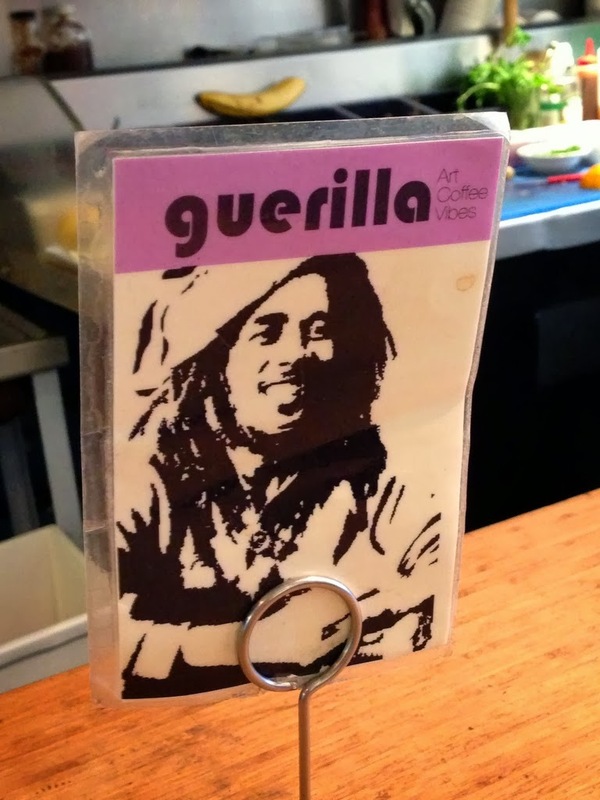 Keen to explore my new neighbourhood, we caught up at North Berkeley favourite, Guerilla Cafe. It was an absolutely glorious day, so it was no surprise that the cafe was a popular choice. We managed to squeeze in at the bar stools, and happily chatted away while watching our brunch being prepared. 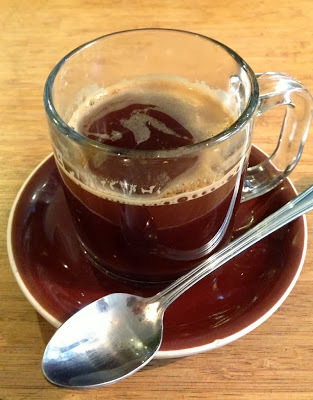 I'm still getting used to American coffee, and in general find it too weak. I suppose it's my fault for ordering a watered-down espresso this time around. Still, I've had many worse cups during my time here. I wanted a wholesome breakfast, and luckily there were many healthy choices on the menu. After some deliberation, I ended up with the Mediterranean Plate. 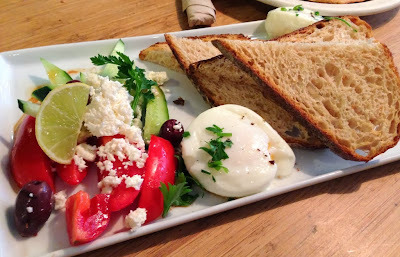 With two poached eggs, tomatoes, olives, feta and cucumber, it was both filling and refreshing. I resisted the urge to lather my warm bread with butter, but with such fresh, healthy ingredients otherwise, maybe I could have gotten away with a little indulgence. 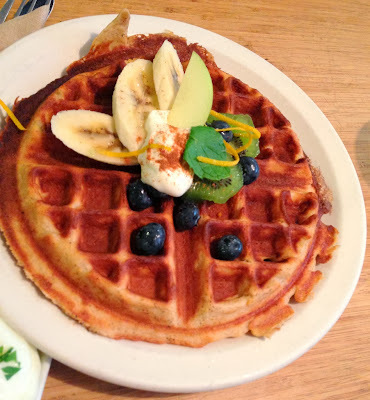 What looked even more indulgent, and what I hear is actually the must-order from the menu, were the waffles. With waffle presented as beautifully as that, how could your day not start off on a great note? Fresh fruit, organic pure maple syrup and creme fraiche, it's simple yet decadent. Perhaps it should be paired for a fruit bowl to get the full feeling of summer, even as we transition into autumn. Guerilla Cafe is definitely a funky, popular cafe in a desirable location. Plenty of vegetarian options abound, with just the right amount of indulgence on offer for those lazy Sundays. Service is friendly and efficient but the space is small so be prepared for a potential wait. My idea of the perfect coffee is still not available here, but the food is worth returning for.